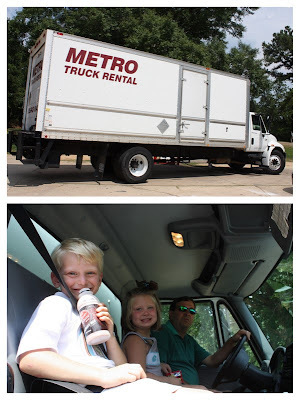 "...And they loaded up the truck and went to the beach, Destin that is..."
We definitely looked like the Beverly Hill Billies... in our big ole 24 foot Metro truck that we took to the beach... but that is what you have to take when you take a mini grocery store along with you! However, I can tell you two little ones that thought they were the coolest thing since sliced bread... riding to the beach in a big ole truck. Jackson rode the whole way with my dad and they both rode about half of the way. Bless my sweet daddy's heart for riding in the truck with my two! However, daddy, go go and I had a nice quite peaceful ride to the beach! :) If you are wondering why in the world we took this to the beach... it is b.c my dad and I had a convention (Alabama Groceries Association) in San Destin this week and we set up a dollar section complete with shelving, product, and all. Image a grocery store isle and that is what it looked like... and we even won an award for The Best Booth! Thankfully there was some play to go along with all that work too!